Superb solo sit on top that's great fun to surf. 2 person tandem version of the Scooter sit on top kayak. Best-selling model of hybrid crossover kayak in 2 outfitting levels. 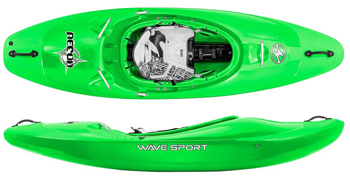 Wave Sport are world renowned for making a great range of white water sit in kayaks. A quick and manoeuvrable whitewater kayak perfect for rapids and creeks. A great beginners kayak at a superb price. The best selling 4x4 of the white water kayak world. High performing creek kayak with classic good looks. Ideal for touring on both flat water and the sea, with the alternate edge that allows a more playful side to the Hydra's many heads. Extremely comfortable and versatile touring kayak with 2 cockpits. Stable tandem touring kayak with 2 seats and an open cockpit. Can also be fitted with a child seat as well. Available in rental and expedition spec with option to fit a rudder as well. Call us for details and availability. A great design of freestyle playboat. 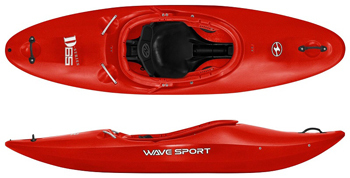 Wave sports' famous playboat, back and looking good by popular demand. Short, fast and a great river running playboat kayak. Forgiving performance makes this a great kayak for beginners through to advanced.